Sting The Scorpion is unraveling with anticipation of Christmas! Follow all Sting's adventures HERE. Sting The Scorpion masquerades as winter clothing! See all Sting's adventures HERE. Post your own dedicated giveaway for this event, from January 6, 2014 at 12:01a.m. until January 20, 2014 at 11:59p.m. Giveaway may be company-sponsored or self-sponsored. Giveaway prize must be worth at least $25.00. Blogs without giveaways posted by 10:00a.m. on January 6 will be removed from the linky list. Signups close on January 3. 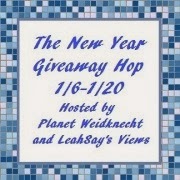 You do not need to post in advance of the giveaway hop, but if you'd like to add the button to your sidebar please link it to this post so that others may join in too. HTML will be provided a few days before the hop begins, both by email and post in the Weidknecht Events Facebook Group. Are you still in need of some amazing stocking stuffers? Get some Santa's Beard Organic Cotton Candy! Available in a festive plastic tub with a resealable lid or a in plastic bag tied with a bow and a Santa sticker, this cotton candy is a wonderful delicious treat! Santa's Beard cotton candy is made to order right here in the USA. Each batch is made from organic sugar and organic vanilla extract, plus it's vegan, kosher, and gluten-free so you can feel good about what your kids eat. Santa's white beard grows more everyday. he wouldn't be able to give presents that day. when one elf discovered "Hey, this beard is sweet!" And asked Santa Claus "Can we package this stuff?" Santa said "Sure, that's a wonderful plan! We'll stuff it in stockings across the land!" Everyone in my family loves Santa's Beard cotton candy! Who doesn't love cotton candy??? Even Sting the Scorpion loves it! Get yours HERE and don't forget to follow them on Facebook and Twitter! Sting The Scorpion says, "OPEN OPEN OPEN!" My new Christmas t-shirt lets Santa (and anyone else who is thinking of bringing me a holiday gift) know that my wish list is a mile long! With "Dear Santa, I want it all!" printed on the front it's a great statement t-shirt for holiday parties, for photos with Santa, and for Christmas day activities. This shirt is available in small, medium, large, and extra large. It's a high quality cotton t-shirt with screen-printing on the front, and it's oh-so-comfortable! Looking for something a bit more festive (or even less festive)? Christmas T-shirt Wonderland has bunches of cute Christmas t-shirts, funny Christmas t-shirts, nostalgic Christmas t-shirts, and even some naughty Christmas t-shirts. A tshirt makes a great gift that they can wear year after year, and they will think of you every time they put it on! Check out their great selection at www.christmastshirtwonderland.com! Looking for a family activity to pull those kids away from all their electronics and screens? This Gold Rush Pay Dirt Gold Panning Kit is the perfect solution. Not only is it fun, you are guaranteed to find REAL gold in every bag of dirt. My family actually panned for gold several years ago in Nevada, so my boys were really excited to see how much gold their bag contained. This kit allows you to pan for gold at home! The Gold Rush kit comes with a pound of dirt, panning supplies and a great video hosted by Parker Schnabel from the hit show Gold Rush that teaches how to pan for gold. We filled up a bucket of water and poured our dirt into the pan to start swishing the dirt with the water. It's an activity that everyone in the family can try and it was so exciting to hear the first "Eureka!" which means "I found it!" Inside each kit there is also a certificate of authenticity and a panning ledger, since panning for gold is an easily repeated activity. Just save the dirt and search again another day! You can even order additional bags of pay dirt. It's also a great teaching opportunity for parents to share information with kids about the history of the gold rush in America. We have, so far, found several pieces of gold and even some rocks with a visible vein of gold running through, but even more valuable was the time that we spent together as a family with the television off and everyone out of their rooms. Sitting in a circle on the floor of the family room, we shared smiles and laughter as we made memories together. This is a fabulous gift idea for anyone of any age! If you have someone that is hard to buy for, they will love this panning kit. Plus there is a chance the gold in their bag of pay dirt is worth up to $500! How's THAT for a way of getting someone interested in panning for gold? There is still time to order for Christmas! Visit www.paydirtgold.com today and order a Gold Panning Kit today! Be sure to follow them on Facebook and Twitter too! Welcome to the #HPFamilyTime Giveaway hosted by Viva Veltoro and Blogging Mamas and generously sponsored by HP! Recently, Ruth fromViva Viva Veltoro had the fantastic opportunity to receive an HP Holiday Bundle to help bring creativity and joy to the hectic holiday season. Ruth received an HP ENVY17 Special Edition Notebook, an HP ENVY 5530 e-All-in-One Printer, ink, and a Snapfish Gift Card and soon started creating cheerful holiday greetings and fun crafts with her new HP products. That's just the beginning of this crafty adventure though! With the launch of the new Blogging Mamas website, be on the look out for even more DIYs, tutorials, and crafts, sure to delight the whole family all year round! HP SmartFriend Complete: Live two-way conversation with our specially trained HP technicians, available 24/7. The HP ENVY 5530 e-All-in-One is a home-use printer built for creative hobbies such as scrapbooking and arts and crafts projects. The unit is also great for families with its ability to print lab-quality photos. With the HP ENVY 5530 e-All-in-One you can scan photos and documents directly to a mobile device for sharing or storing, as well as view photos and print quickly from the 2.65-inch color touchscreen on the front of the unit and memory card slots. You can also print wirelessly from virtually anywhere you roam directly from your smartphone, tablet, and internet-connected PC. This printer is also full of value - you can print more for less with optional high-capacity cartridges, or enroll in HP Instant Ink (their new ink replacement service that can save you up to 50%). Isn't this a fantastic prize package?! How would you use your HP Bundle to connect with your family during the holidays? To enter to win an HP Holiday Bundle, including an HP Chromebook 14 and HP ENVY 5530 e-All-in-One Printer, use the Giveaway Tools form below. This giveaway is open to US residents, ages 18 and up. Ends on 1/5/14 at 11:59 PM EST. Sting The Scorpion is hoping for a shower of Christmas gifts! Welcome to Tasty Tuesday Recipe Link Up! 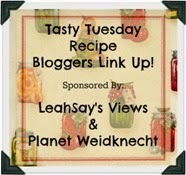 Join us each week as we add new recipes to our Tasty Tuesday Link Up. Recipes shared need NOT be 5 star rated restaurant quality to impress. Lisa and Bonnie would love it if you would: Please link back to our blogs or posts. You will find the button above if you wish to add it to your site. The recipe needs to be a recipe YOU made. Please do not link to a site other than your own. Brown the sausage in a skillet. Chop at it as you brown it, to break it into small pieces. Drain and pour sausage into a large bowl. Pour two cans of Nacho Cheese Soup into the bowl and mix well with the sausage. Slice the baguette bread width-wise and lay out on a cookie sheet. Using a spoon, spread the sausage cheese blend on each slice of baguette. Try to get the cheese to the edges. Bake in preheated oven at 350 degrees F for 25 minutes. Serves 6. This was SO easy and everyone LOVED it! We had it for lunch but it would be a fabulous party appetizer too. Your turn to share a recipe! So many winners to announce in December! 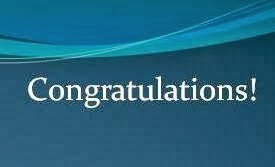 Congratulations to our newest winners! 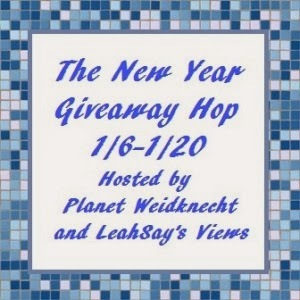 Enter my newest giveaways HERE. Give the gift of an American-made bottle. Liberty Bottleworks is the ONLY metal bottle made in America. I love my tall pink Liberty Bottle, but you can choose from hundreds of colors, sizes, and designs. They even have great holiday designs! Many of their designs are created by local, small, and unique artists. These fabulous bottles give me the peace of mind that I'm drinking BPA-free water. The wide mouth allows me to easily add ice-cubes and get a smooth drink every time. These fabulous bottles have a single twist, easy on and off lid with convenient carry tabs built in. Plus it fits in my car cupholder without a problem. Made from recycled materials, Liberty Bottles exceed FDA safety requirements, are non-toxic and non-leaching. Plus a percentage of every reusable bottle sold is given to organizations and people in need. I use it mostly for my lemon water, but it's been known to have a few other of my favorite drinks inside! It's a fabulous bottle that I reach for again and again. They have also just released a new line of bottle "socks" so your bottle can be as fashionable as you. Make a statement with a Freaker that matches, clashes, or turns heads. I've gotten tons of compliments on my Liberty Bottle and owl Freaker! Everyone seems to love it as much as I do. It's a fantastic and unique holiday gift idea that is good for the environment and good for the user. There may or may not be some extra strong "holiday cheer" in my Liberty Bottle this Christmas. Visit www.libertybottles.com to order one for all your family and friends. Follow them on Facebook, Twitter, and Pinterest so you can be first to hear about great new designs and special promotions! Sting The Scorpion grew a cotton candy Santa Beard! Like to play online games? Like to shop? Like free stuff? Me too! I joined Play2Shop, a fun community where I can play games, earn rewards and get free stuff! You can join too and create your own free account! Sign up HERE then enter my giveaway below! Play2Shop combines the best of casual gaming sites and shopping reward sites to create a place where we can earn rewards and cash back for shopping at over a thousand partner merchants like Amazon, Tiger Direct, Kohls, Toys R Us, and many more. Playing games is always more fun when you get rewarded! Game categories include: Arcade Games, Board Games, Card Games, Puzzle Games, Racing Games, Shooter Games and Strategy Games. They even offer mobile-friendly games. 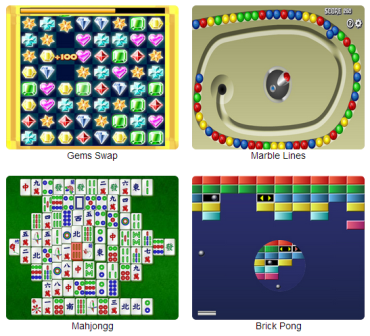 It's a great site that is really easy to navigate and they have my favorite games. Sign up HERE for free and don't forget to enter to win my $50 giveaway below! You can instantly turn your Play2Shop reward points into free stuff like merchandise and gift cards from your favorite retailers in the Play2Shop Prize Showroom. You can even use your reward points to enter exclusive tournaments or bid on prize auctions for the chance to win other great prizes. Join the fun HERE to start saving and get rewarded today! or $50 Paypal Cash below! Winner must be a member of Play2Shop at the time of the giveaway or prize will be forfeited. 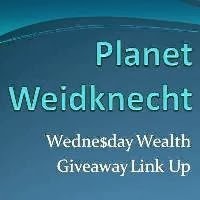 Giveaway is open worldwide to anyone able to receive an Amazon Gift Code or Paypal Cash. Must be 18 years or older to be eligible to win. One winner will be selected. Winner may choose either a $50 Amazon Gift Code or $50 Paypal Cash. Giveaway ends at midnight on 1/6/2014. Only the first entry is mandatory; bonus entries increase your chance to win. Void where prohibited by law. If every single person makes one small change in their daily lives, collectively we can make a huge positive impact on our world. Tetra Pak encourages all of us to Become Carton Smart and make a smart choice this holiday season by choosing foods packaged in cartons when filling our pantries and feeding our families. Pacific Foods is a brand that is committed to doing the right thing for you and me, the environment, and their employees. They have a huge selection of pantry-stable foods, from chicken stock to pumpkin puree and cranberry sauce, all of which I received to create a holiday meal. Tetra Pak cartons are made of 70% paper, a renewable resource, from selectively harvested, regrown trees that are FSC-certified (Forest Stewardship Council). Cartons use only 1/3 of the packaging compared to cans, or even an egg! Cartons are also recyclable and result in 60% less landfill waste than cans. The unique packaging process preserves flavor and nutrients without the use of preservatives. Cartons are so easy to store because they take up less room and are even stackable in my pantry. I was very pleasantly surprised to discover they are very easy to open too! They are also recloseable so I can use just what I need, then store the rest in the fridge right in the carton. I used my Pacific Foods Pumpkin Puree to create White Chocolate Chip Pumpkin Muffins that are incredibly moist and delicious. I mixed a 18oz white cake box mix with the carton of Pumpkin Puree, plus 1 tsp ground Saigon cinnamon, 1/2 tsp ground nutmeg, and 3 tsp white sugar. Then I folded one cup of white chocolate chips into the batter. Then I sprayed some cooking oil on a muffin pan, preheated my oven to 350 degrees F, and spoon-scooped the pumpkin batter into the pan. The Pumpkin Puree is wonderfully thick and so fresh! I baked them for 25 minutes and my house smelled amazing. They came out so delicious-looking that it was hard to let them just sit there on the counter to cool down. When my husband and my son got home, it was decided we were having dessert first. They are so moist and simply dreamy! I made Garlic Chicken with the Pacific Foods Chicken Stock. I poured the entire carton into a 9"x13" baking pan, stirred in a tablespoon of chicken rub spice, placed five boneless chicken pieces into the Chicken Stock, then sprinkled chicken rub on each piece. I chopped half a white onion and added the pieces around the chicken, sprinkled some minced garlic on top of each chicken piece, then covered the pan with foil and baked at 350 for an hour. The Garlic Chicken was incredibly juicy and very tasty! I whipped up a five minute stuffing as our bread side and simply opened the carton of Pacific Foods Cranberry Sauce for our fruit side. It slid right out of the carton onto the plate and all I had to do was slice it. I'm not one to eat much cranberry but this Cranberry Sauce is awesome. It was a simple and delicious meal, with no leftovers, to celebrate my son arriving home from college for the holiday break! You can be Carton Smart too! First you can Follow #CartonSmart on Pinterest and Tweet @CartonSmart then shop your local store for Pacific Foods packaged in Tetra Pak cartons. Share your #CartonSmart holiday feast! What will YOU make? Do you have smart entertaining tips for great tasting foods with little waste? I'd love to hear your ideas! Sting The Scorpion has a spa day to relax from the hustle and bustle! I'm so excited to share two new products with you that I really like. I received a jar of Ageless Derma Anti-Aging Intensive Skin Brightener and Ageless Derma Natural Foaming Scrub. I've been using them for only a week so far and I've already noticed a difference in my skin! I've been starting my morning skincare routine with the Ageless Derma Natural Foaming Scrub. I love the thick and grainy feeling as it goes onto my face. It foams up nicely to deep cleanse, and helps exfoliate my dead skin cells, leaving my face feeling so refreshed and squeaky clean. It's like a spa facial experience at home! I also love the easy-to-transport, snap-lid bottle it comes in so I can take this bottle along with me when I travel. The Ageless Derma Anti-Aging Intensive Skin Brightener is probably my most favorite skin product I've tried all year long. The jar has an ingenious push-down button that releases a small amount of the product that I then apply to my face with my fingers. I love the smooth feel of it going onto my skin and it absorbs quickly without leaving my facial skin feeling heavy. It gives my skin a beautiful glowing look without looking too shiny. It also evens out the ruddiness in my skin and reduces the look of age spots. It's a fabulous product and I'm excited to see what it does over a few months of time! Find out more about these Ageless Derma products at www.agelessderma.com as well as many other products that help to keep your skin young and healthy. Even the celebrities are loving Ageless Derma! You can follow Ageless Derma on Facebook and Twitter.